All modes are available in knots, meters per second, kilometers per hour, miles per hour, feet per minute, or Beaufort scales at an accuracy of ±3%. Unit automatically shuts down after 45 minutes﻿. 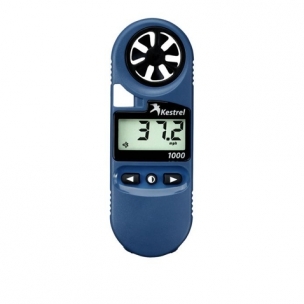 To measure wind speed, this meter relies on a precision, ultralight, anodized aluminum impeller shock-mounted in glass-reinforced plastic housing. Impeller can be popped out and replaced if necessary. Two-year manufacturer’s warranty. Minimum speed: 0.3 m/s (0.6 knots, 1 km/h, 0.7 mph, 60 fpm). Maximum speed: 40 m/s (78 knots, 144 km/h, 89 mph, 7,830 fpm). Wind speed accuracy: ±3%. Operating range: -4°F to +140°F (-20°C to +60°C). Update: 1 second. Sealing: electronics enclosure IP67 – water resistant to 3 ft. Floats﻿. Battery: CR2032 coin cell with a typical life of 400 hours. Dimensions: 4.8" x 1.7" x .6".